When you see an item you like, move the mouse on top of the picture and click the "Add to cart" button. This puts the item into your shopping basket or cart, and then you are given the chance to continue shopping. To check what's in your shopping bag at any time, simply move your mouse over the "Cart" image on top of the page. After you have finished shopping, click on "Cart" image on top, and then select the green Checkout button. Email Address -- of the person placing the order. To make sure you type it correctly, we ask for it twice. First Name -- of the person placing the order. Last Name -- of the person placing the order. Address -- Where the order will be delivered. It can be general like "Adenta Estates" or "Spintex Road At Manet Junction". You can also give more details in the "Delivery Method" section. City -- Use your best judgement (Example Abeka-Lapaz, East Legon, Bubuashie). Mobile Phone -- of the person placing the order. This number should start with the country code. For example, if the number is 0244123456 and it's a Ghana number, type it as 233244123456 (remove "0" and replace with "233"). This is necessary so that our site can automatically send you SMS updates about your order. Checkbox under "Mobile phone" -- If you don't intend to pay on site with a debit/credit card, no need to select this box. Select the one which best fits your delivery address. You may create an account for an easier checkout in the future. Click "Check here to create a Juliepastry.com account", then choose a password that you can remember... but not too simple. To increase the quantity of an item, click the up arrow (highlighted yellow). To reduce quantity, click the down arrow (highlighted pink). You can also just click into the box and type a number. There's no need to press enter key if typed in. Choose how you want to pay. 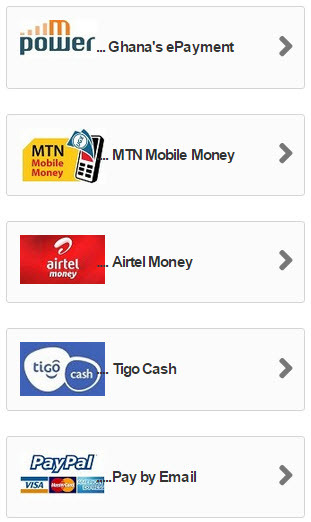 If shopping in GHS/Cedis, you'll be presented with the following payment methods. Select by clicking once (it can be changed later). If shopping in another currency, since we only offer a single payment method for now (on site credit/debit card processing), your payment is taken out of your financial institution's or bank account instantly. Please contact us if you have any questions or concerns before or after ordering. We are working hard to add other payment options for our non-GHS shoppers. 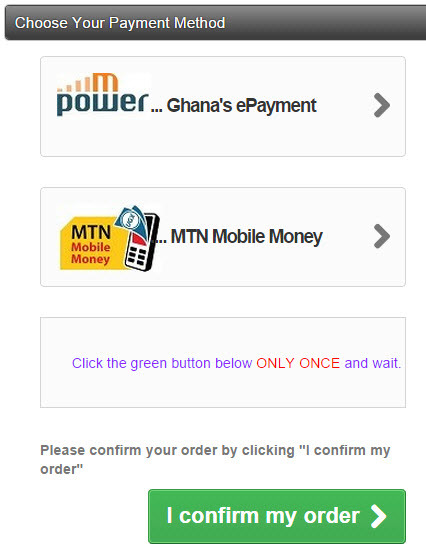 Click the green "I confirm my order" button only once, and wait (the following example shows MTN mobile Money as your selected payment method). This confirmation step is very important because it's when your order enters our computer system, and then we get notified. We rely on our computer system to tell us who has ordered, what was ordered and more. Note: even if you phone in your order, we still enter it into our computer system. Finally, you are taken to a page which shows a summary of your order, and instructs you what to do next. At this point, an e-mail and/or SMS has automatically been sent to you.